I cannot believe it happened to me; my precious GBP died! I kept giving it away to people, mostly as a surprise bonus gift on my workshops, and didn’t notice that it stopped reproducing. In the end, all that was left was a small bunch of sad, slimy grains. Despite my enormous resuscitation efforts*, the grains never grew again and eventually almost completely dissolved. If you are wondering what GBP is, in short, it is a special kind of ginger beer starter in the form of grains similar to tibicos. It is very rare and hard to get in its original form. I wrote about it in one of the previous posts and here you can read how to use GBP to make ginger beer. My story of dying GBP sounds a bit dramatic. But, as a matter of fact, I could just buy a new one from the same source as before for a few euro. However, instead of doing this, I decided that it’s a perfect time to, finally, try out the ginger bug method of making ginger beer. Ginger bug is a starter for ginger beer (or other sodas’) that you can easily make at home from scratch. Basically, it is just fermented ginger. 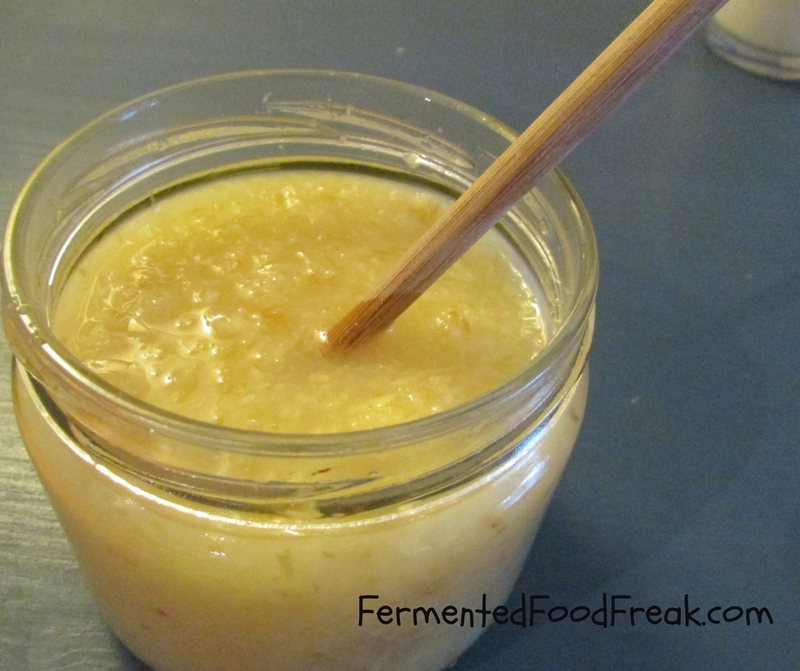 I followed the recipe from “Wild Fermentation” by Sandor Katz, and it works very well. Grate 2 cm long piece of ginger (with skin), add two teaspoons of white sugar and a cup of unchlorinated water to it. Mix everything together and leave in a warm place. The next day, mix in another grated piece of ginger and two teaspoons of sugar. Repeat this step every 1-2 days until the mixture starts to look bubbly and smells “yeasty”. At this stage, strain the ginger out of the mixture and use the liquid part to make your soda. You can spare 1-2 spoons of this liquid part as a “booster” for a new ginger bug. 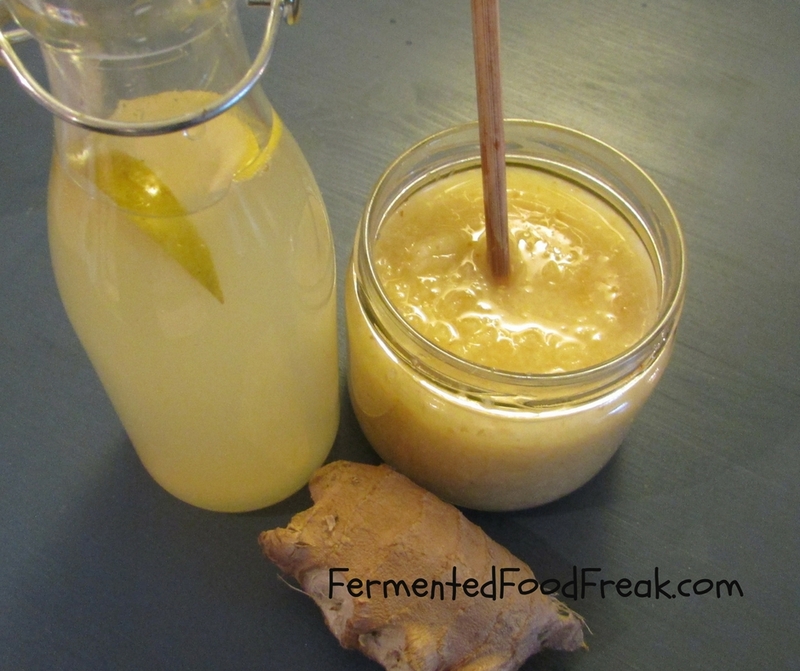 To make ginger beer out of my ginger bug, I had a look into “Wild Fermentation” again. I followed Sandor’s recipe but, after a few trials, I modified it a bit. I use less sugar than recommended, didn’t use lemon juice and didn’t dilute the final mixture with water. Add the ginger and sugar to the water and bring it to boil. Keep steaming for about 15 min, then cool down to the room temperature. Strain the ginger pieces and add the liquid part of the ginger bug. What you have got is ginger beer ready to be bottled up. The proportions I gave you are enough to make two 750 ml bottles of ginger beer. You can use normal glass bottles, but be very careful. Ginger induces very intensive carbonation, so make sure your bottles are sealed tightly. In which case, you cannot keep your beer bottled for longer than 5-7 days without risking an explosion. Alternatively, use plastic bottles (like coke bottles) and fill them up ¾ of the way, releasing the gas whenever a bottle is very hard and looks like it is just about to explode. Sandor Katz recommends keeping ginger beer bottled for two weeks and claims it still will be non-alcoholic. It feels awkward to disagree with the guru, but I dare to say that it’s impossible. Ok, maybe you won’t get dead drunk with it, but it will be boozy enough NOT to give it to kids. Sometimes, I have to skip the cooking part and just mix strained bug with sweetened water. It still makes a pretty tasty drink. This simplified method can be used to make different kinds of ginger sodas; just add some fruit, juice or herbs. For example, if you want to have ginger-raspberry soda, add your ginger bug to water with sugar and raspberries. Thank you for reading! I wish you a beautiful end of Summer. *By resuscitation I mean placing the grains in a small amount of sugared water, stirring as often as possible and changing the water every 2-3 days until the grains start to look healthy again. Do you know a better method? Let me know in the comments or on my Facebook page. We definitely need to try making this. Always up to try a new fermenting endeavor! Thanks for the warning about exploding bottles. Thank you for the comment! If you are lucky to live in a warm climate you should definitely treat yourself with homemade ginger beer all year round. I keep my fingers crossed for your bottles not to explode! Next Next post: What is Kimchi?